Code discovered in iOS 9 beta 1 has just about confirmed not only the existence of Apple’s upcoming 12.9-inch iPad, but also the exact resolution that the behemoth of a tablet will be boasting. Wang made this discovery digging into the code of the supposed iPad Pro-optimized keyboard found in iOS 9 just a day back. The display resolution might seem a bit odd to non-Apple consumers at first, but this pixel arrangement gives the machine a familiar 264 pixels-per-inch density, which is consistent with the Cupertino giant’s lineup of 9.7-inch iPads with Retina displays. Earlier, another report pointed us in the same direction, noting that the next-gen iPad will have a pixel density of 264ppi. Initial rumors had claimed that the tablet could sport a 2K display, or if Apple really had a flair for the dramatics, it could push that up to 4K. However, observers remained skeptic of whether Apple would want to drop the 4:3 display ratio in the iPad which has proven to be very successful up till now. The upsold rumors regarding the display were helped by the likelihood of Apple introducing a new and much powerful A9 CPU into the equation for its newest and biggest iPad, but fact of the matter is, all is hush on the hardware front as well for now. Force Touch is likely to make the final cut for iPad Pro, along with the USB-C connector, which Apple seems to have taken a liking to. For now though, the display resolution discovered thanks in part to iOS 9 is possibly the only strong footed proof we have right now of what the 12.9-inch iPad Pro will be like once it’s released. Sounds like that new super thin macbook will just become the iPad pro without the keyboard. Im assuming iPad pro will run full OS X. Surely not IOS. This could be a really cool graphics tablet. Like you folks I’m really struggling to see the mass appeal of a larger iPad. Yep it might make a good graphic’s tablet but this is too niche for Apple. Like most people I’d love to see OSX not iOS on the device. I have just started using my new MacBook 12 inch which is my go to device, it so portable and iPad like but with a full OS. That said iOS is truly built for touch, the on-screen keyboard works so well with all the applications on iPad, it moves so well to accommodate the App one is working on. OSX on an large iPad and the multitude of applications are are not designed for this, this is the nightmare that is Windows 10, it’s not a tablet OS and neither are nearly all the Apps. It appears to me that this is a bridge device to a future ipad in the same size format that runs OSX. 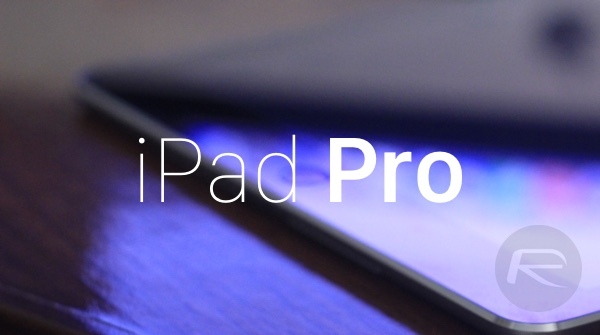 My guess is that this device will not be billed as the “iPad Pro” but rather will be marketed as an “iPad Plus”. This device tests the marketability of the form factor, and the next device would run some flavor of touch optimized OSX that borrows heavily from IOS and then get the “Pro” moniker . Microsoft has made a huge investment in the Surface tablet as a laptop replacement (and eventually a desktop replacement), so I think that the tablet space becomes the battleground for an all out OS war. After all, who needs 2 tablets? Well now that iOS has split screen multitasking and video detachment… a lot can be accomplished. You say ‘static grid of icons’ like its a bad thing, no one wants a cluttered mess, that’s why the Mac also offers a simple dock of icons, and a launchpad grid of icons. My guess, this is targeting Businesses.